NOTE: We cannot emphasize strongly enough the value in steeping this wonderful leaf carefully. Being a single leaf manufacture, with its surface area fairly exposed, it is similar to the Tai Ping Hou Kui, in that it will scorch easily if blasted with boiling hot water inadvertently. Quite a bit of care went into plucking the leaf, carefully firing and shaping it, and then sorting and drying it so that it would arrive at its destination: your teacup, in perfect condition. The final step is now under your control, so please complete the circle by steeping it appropriately. It is very interesting to steep this leaf for varying amounts of time – from 30 seconds to 2 minutes. This is where your preferences can be manifested, but please be particularly vigilant about the temperature of the water because the recommended 160°F-170°F is well off the boil. If you don’t have an instant-read thermometer or are in a bit of a hurry, the best method for cooling the water effectively is to put a small amount of cold water in the bottom of the teapot or teacup before steeping. One great way to do this is to rinse the leaves with cold water, leaving a small amount in the steeping vessel. This method will usually bring the temperature of the steeping water down to the correct one for steeping Spring Green Tea and help to preclude any scorching of the leaf. Here at Tea Trekker we are extremely pleased to offer our second shipment of 2018 Lu An Gua Pian. This lot is very similar to our first shipment; however, you may find that this one is slightly more flavorful due to the fact that it was harvested about ten days later than the first shipment that we sourced. And the leaf is just a little longer, for the same reason. But both lots are exactly as we wanted them to be: basically the same, but with the normal slight difference that reflects the exact time of harvest. This second manufacture of 2018 Lu An is Superfine Grade also, as was the first shipment, and is truly a delicious, rich-tasting green tea. Some of you may know it from previous years by its former name, Lu An Melon Seeds (a transliteration from the Chinese due to the leaf having the appearance of the seeds of many members of the cucumber family, which are quite auspicious in East Asia). Lu An Gua Pian is a famous green tea grown in the Qi Shan and hill areas in three neighboring counties of Anhui Province: Lu an, Jinzhai and Huoshan. This area is situated northeast of the Yellow Mountains (Huangshan) and is comprised of dense forests, bamboo groves, waterfalls and small, remote patches of tea gardens. We visited this remote area on our first trip to China after we visited one of the tea factories that manufactures Tai Ping Hou Kui tea. It was decided that the best way for us to get to the tea factory at Qi Shan was by boat across the Xianghongdian Reservoir and then walk to the village, rather than drive through the dense mountains. The garden in which this tea is grown is protected by a bamboo grove that serves to define the contour of the tea gardens. This is a unique tea with an unusual style of manufacture. Unlike most green teas which are made from buds only, or a bud and one leaf or a bud and two leaves, Lu An Gua Pian is made from one solitary leaf: the first single true leaf, which is located below the bud-set on the branch. Lu An Gua Pian has a short production season, and the best grades of this tea are completely handmade. Our grade – Superfine – is such tea. Lu An Gua Pian is a Yu Qian, Before the Rains (2nd harvesting season) tea – because the leaves must be left on the bush to grow to a particular size. This leaf is plucked very carefully – the pickers must pluck beneath new growth and take a little twig along with the single leaf. This is to prevent the leaf from being torn. Inside the tea factory, the twig is carefully removed by hand. This is the only Chinese green tea that we know of that is made from a single leaf from a specific position on the tea branch, although there may be another that has been historically passed-down, and may still be revived by a modern-day tea enthusiast somewhere in a remote part of China. Inside the tea factory, we watched this tea being made. Two workers sat side by side in front of hot tea firing pans.The workers moved a portion of leaf from one tea firing pan to the other with little hand brooms especially made for the job. One firing pan was hotter than the other – moving the tea thusly kept the leaf from resting over the heat of the firing pan for too long. Also the brooms facilitated the shaping of the leaves into their familiar, long, wrinkled shape. After this was done a dozen or more times, the leaf was moved to a bamboo firing basket that was placed over a low ember fire for final drying. The basket was placed over the charcoal fire for a few seconds and then lifted off the charcoal to rest a minute before being set once again over the charcoal fire. This was repeated a dozen or more times until the leaf was fully fired. Lu An Gua Pian tea was first known during the Tang dynasty. Later, under the Ming and Qing dynasties it became a Tribute Tea exclusively made for and drunk by the emperor. 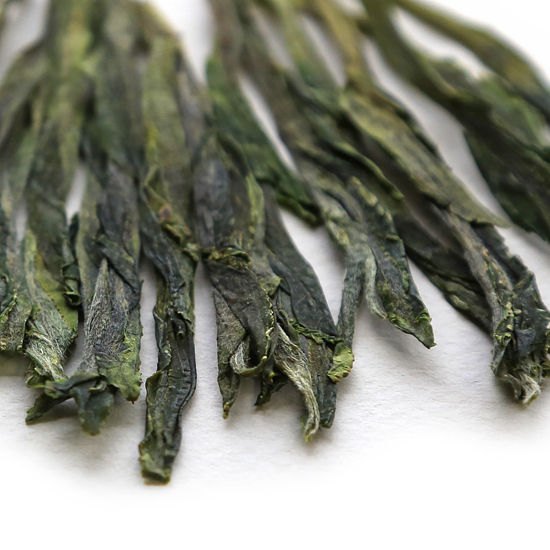 However, today we can all enjoy its full-bodied, rich green tea flavor and concentrated, almost chewy body. Lu An Gua Pian is not flowery or grassy but has a lovely rich quality due to its later harvest date. Green teas from Anhui Province have a ‘special something’ about them because of the terroir of the lush mountain areas in which they grow. Tea Trekker’s 2018 Guapian has the classic style of an expertly-made, pan-fired tea with a light astringency on the palate and just a hint of ‘returning flavor’. After being re-hydrated during steeping, the shape, uniform size, and colour of these individual leaves resemble ‘melon seeds’. Because of this visual similarity, this tea is named melon seeds – guapian – in Chinese.